(Marc Smith/DiscoverMooseJaw) The best junior hockey players from Canada, Finland, Sweden and the United States will be in Kamloops, B.C. this week for the 2018 World Junior Summer Showcase. The Moose Jaw Warriors will have one player on the ice as defenceman Jett Woo gets set to show his stuff. The Vancouver Canucks’ 2018 second round pick said he’s looking forward to the camp, “Any time you get to have the chance to go to one of these camps and put on the jersey, or even the practice jersey, it’s an honour to be recognized as one of those players,” said Woo. Warriors forward Justin Almeida and defenceman Josh Brook were invited to the camp, but were ruled out with injuries. Being a player that has suited up for Hockey Canada on multiple occasions already at the Under-17 and Under-18 levels, Woo knows what it takes to play for a national team. He said attempting to crack the national junior team is a whole other animal. “I wouldn’t be in this situation without doing the things that I’ve been taught growing up, so I’m going to continue to do those things,” said Woo. 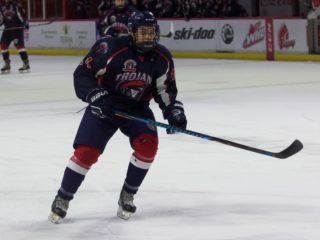 The Winnipeg product is coming off his first professional camp earlier this month with the Canucks after being selected with the 37th overall pick in June’s NHL Draft. 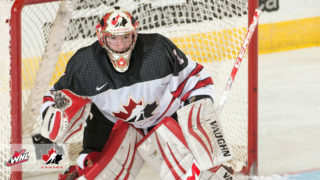 Woo said his experience with the Canucks will serve him well going into the World Junior camp. “I was pretty nervous going into that camp and to get that over with and learn as much as I did and to go into this camp with guys that have been to development camp once or twice, it’s good that I have one under my belt,” said Woo. Coming out of that camp, Woo said he knows that his game still needs work. “I want to do is continue to round my game in all areas and as well as just getting stronger and faster off the ice, so just continue to do those things and learn is what I’m trying to do this offseason,” he said. One thing that will help Woo at the Hockey Canada camp is the fact that his Warriors head coach, Tim Hunter, will also be behind the bench for Canada. 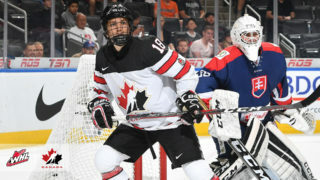 The World Junior Showcase is the first step for players looking to suit up for Canada at the 2019 IIHF World Junior Hockey Championship this December in Vancouver and Victoria. 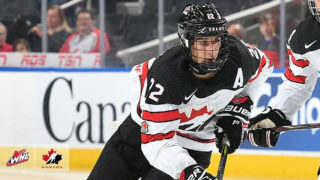 Canada will dress two teams to face a USA split squad on Tuesday and then they will combine the two teams to take on Finland on Thursday, Sweden next Friday and then the Americans again next Saturday to wrap up the mini-tournament.